PhotoReading is a system of reading techniques that helps you learn to read books at a much faster rate. With PhotoReading you learn to efficiently extract the key ideas from whatever you decide to read. One problem with normal reading is that you have to read each book to determine whether it's worth reading. That takes time. There's tremendous variety in the value of different books to you. Some books are a waste of your time. Other books contain one or two useful ideas. A few books will be incredibly valuable from start to finish. PhotoReading solves this dilemma by training you to use a nonlinear, multi-pass method of reading. With PhotoReading the amount of time you spend on each book is proportional to its value to you. Your first pass through a book will usually take about 5 minutes. In some cases you'll stop there because you've extracted all the key ideas you need. In other situations you'll make additional passes until you've squeezed as much knowledge out of the book as you're going to get. The PhotoReading system will give you the tools to do this. It's very engaging and makes reading more enjoyable too. I used to think that reading meant processing every word in order. Now I understand that reading is really about value extraction. In most cases it's inefficient to read a book linearly from start to finish if your goal is to extract the core ideas that matter to you. PhotoReading save you time, and it increases your comprehension and memory because your focus is on extracting core ideas, not on reading every word. Keep in mind that after you learn PhotoReading, you can still read books linearly if you choose to. If you want to read a fictional story like Harry Potter, I'd recommend that you slow-read it to immerse yourself in the story and enjoy the surprises and plot twists as J.K. Rowling intended. PhotoReading is great for nonfiction books where the goal is to gain the knowledge that's important to you. That's the low end. Some books you'll be able to read 10x faster. You can PhotoRead a lot more books than you can slow-read. This will expand your horizons, allowing you to explore subjects that you never had time to get into before. It's easy to PhotoRead ebooks on any type of device. PhotoReading's nonlinear, multipass reading strategies give you each book's most valuable ideas. Since PhotoReading focuses your mind on a book's core ideas instead of scanning every word, you'll retain more of what you read. PhotoReading keeps your mind fully engaged, so reading feels more stimulating and alive. You can absorb a whole book in a single reading session. PhotoReading can be especially valuable for students and for people who do a lot of research. PhotoReading enables you to consult many more outside sources in addition to getting through your usual materials more quickly. One suggestion for students is to PhotoRead all of your textbooks during your first week of classes. You'll be pleasantly surprised at how much more you learn and retain. The PhotoReading course comes in two versions: the Main course and the Deluxe course. The Deluxe course includes extra bonus videos featuring live PhotoReading seminars. The videos help you get into the mindset of practicing and applying PhotoReading and knowing that it works. 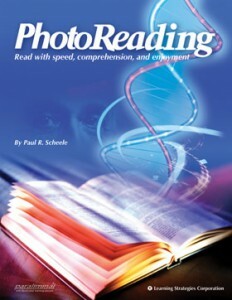 About two-thirds of StevePavlina.com readers who purchase PhotoReading buy the Deluxe course. Just so there's no risk to you, you also get a 30-day money-back guarantee. Try the PhotoReading system for 30 days, and if you aren't happy with it, just return it for a full product refund.